My training as a chemical engineer has led me to be curious about what makes up the matter that surrounds us. This matter is invariably composed of 118 basic elements that we call atoms. Then, these 118 atoms combine with each other to form molecules more or less complex. These molecules then organize themselves into incredibly regular piles that we call crystals. Finally, these crystals --large and small, aggregated or simple-- make up most of the natural, inorganic solid material (that is mountains, rocks, stones and metals). Take for example a tiny grain of table salt with an edge of about one millimeter in length: it is a cube consisting of a perfect alignment of 1,770,000 sodium atoms separated by as many atoms of chlorine in identical fashion in all three directions. That makes a total of 44 quintillion atoms in perfect alignment! With a little imagination, the edge of this cube is the equivalent of 3.5 million soldiers marching in perfect rank and file, each 100 meters distance from the other, in a straight line stretching from the Earth to the moon. Not a single head rises above those of his comrades. And this same pattern repeats itself on the other two edges. These crystals are usually small (such as for salt or sand, whose grains can only be seen with a magnifying glass), and are assembled into rock (think of the حجر رملي of the cities of the Lebanese coast). The same can be said for metals and all that makes up ordinary solid matter. What we call minerals are these solid forms found in nature and that have a determined chemical composition; the limestone of Lebanon, for example, is a conglomerate of tiny crystals of calcium carbonate called calcite. In some cases, however, the crystals become quite large with perfect geometrical forms and astonishing colors visible to the naked eye, shedding a dramatic light on the microscopic geometry of the stacks of atoms from which they are made. I have always been struck by the mystery of how such order could come from the chaos that surrounds us, by the amazing variety of geometric forms that is born of these crystals, by the perfection of the plane surface and the angles between them. I have never had a talent for sculpture or drawing, and so I found myself all the more intrigued by these wonders of creation that have formed without human intervention but, rather, under the sole influence of temperature, pressure and the incredibly complex work of water and especially time. I wanted to share this wonderment for the esthetics of the mineral world on which life has built itself on this planet. Anyone who has not yet been exposed to this world naturally asks: “Who sculpted these marvelous shapes and polished the incredible flat surfaces; who composed this arrangement of different specimens; where do these colors come from?” They are convinced that such things could only be formed by the hands of an artist; they simply cannot believe that natural forces created them. The crystals exhibited are often the most beautiful ore specimens of the utmost industrial importance because they provide us with iron, copper and all the other metals used in modern economies. Some are also gem stones, whether precious or fine, that usually end up as jewelry. Some others are the source of extremely rare elements having important physical and chemical properties. Still others are made from crystalline edifices whose properties, once understood by scientists, indicated how they could be synthesized to revolutionize electronics and the science of modern materials. Further, these minerals are closely intertwined with the development of ancient civilizations, as attested to by the trade routes between Phoenicia and the British Isles for tin, an essential element in the fabrication of bronze (ancient bronze was an alloy of tin and copper, or more rarely an arsenic and copper alloy.) Copper and tin ore are rarely found in the same place, and so the bronze civilization developed thanks to international commerce. We find evidence of this commerce between Burma and Mesopotamia (for rubies, 21 centuries ago) and again between Afghanistan and Egypt –a distance of more than 4,000 kilometers—for lapis-lazuli (55 centuries ago)! And other examples abound. In our time, numerous adventurers have risked their lives in their quest for small stones (the Garimpeiros of Brazil, emeralds (the Guaqueros of Colombia), gold (the gold rushes of California and Amazonia) and diamonds in South Africa. Many started out in order to escape misery and poverty, while others succumbed to a stone fever as dangerous as gold fever. If the tiny crystals invisible to the naked eye can be found in great abundance (as they make up the most of the solid matter that surrounds us), crystals large enough to be exhibited in a collection are very rare. As they are often extracted in mines, with the use of explosives, only to be transformed into metals, chemical products or gemstones, most crystals do not survive this destruction. Unlike the biosphere, where species in danger of extinction can be brought back thanks to environmental protection, our mineral heritage is destroyed forever and cannot be reconstructed. Still another goal of this collection is to conserve mineral samples in the same way that works of art are conserved in museums. Thus, this collection was born in 1997 when I began to buy minerals, both from contemporary mines and from old collections, in different countries. I was greatly helped by several traders, as well as by the enlightened advice of Jean-Claude Bouillard, curator of the mineral collection of the Sorbonne (Université Pierre et Marie Curie) in Paris, one of the most prestigious. These purchases sometimes resulted in veritable “battles” between collectors eager to swipe up the most beautiful specimens. And sometimes luck smiled upon me in the form of inside information on new discoveries or specimens with which prestigious collections were willing to part. Traditionally, the collector has two main options: either he specializes in a few well-known minerals with a strong visual impact (such as calcite, quartz, fluorite, rhodochrosite, tourmaline, beryl), or else he tries to collect all the mineralogical species (called a “systematic” collection). My choice was for the latter because, in my view, it allows for a much truer representation of the incredible richness of the mineral world. To be more precise, of some 4,500 mineral species established ,only 250 to 300 on Earth yield specimens that merit being exhibited (the others present microscopic crystals or rocky samples devoid of any visual interest). These are the specimens that I have collected. But as easy as it is to find quality specimens for classic species (tourmaline, calcite, quartz, etc. ), it is all the more difficult to find such quality for the much rarer and less known species such as spangolite, geocronite, parahopeite, etc. And that, for me, was the challenge: how to harvest as many beautiful samples of this latter group as possible, so that they might appear in the exhibit alongside the so-named “beautiful” specimens? It was patience and tenacity that, as early as 1997, led me to hunt for certain pieces from prestigious collections (Sams, Romero, Wilber, Asselborn, Freilich, Smale, Weill, Horner), sometimes as far as the best-known museums (the museums of Houston and Tucson, the British Museum), and finally to buy them and add them as trophies to the MIM collection. 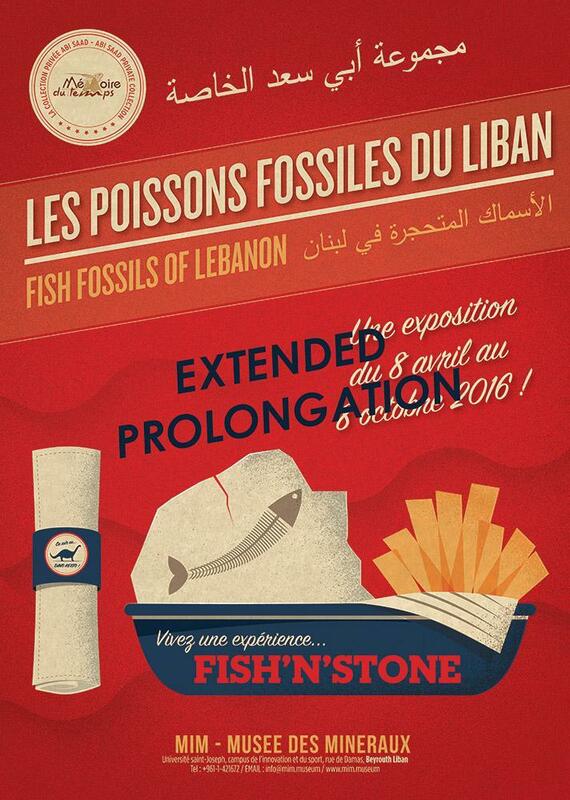 with the goal of promoting the science, culture, language and image of Lebanon. It was with this in mind that I thought that a university would be the ideal place to exhibit this collection in a permanent way. And I decided to follow the example of the collection of the Sorbonne (currently at the University Pierre et Marie Curie, Jussieu campus in Paris), which has always been my model and my main source of inspiration. When in 2004 I spoke of this ambitious project with Father René Chamussy, rector of the University Saint-Joseph in Beirut, he immediately came on board and reserved for the collection a 1300 m² space in the basement of a building then under construction on the Campus for Innovation, the Economy and Sports near the National Museum of Beirut. I then asked myself what name I should give the museum. Rather than a French or English name, I was looking for an Arabic name since the museum is in Lebanon. I also wanted an original name, and I wanted to void the usual names like the Museum of Mineralogy of Beirut. I contacted a publicity agency in Beirut and they proposed MIM, the 24th letter of the Arabic alphabet. The Arabic MIM is also the equivalent of the letter M of the Latin alphabet, and in Arabic it is the first letter of the words for “museum”, “minerals” and “mines” (and it also works in English and in French). In addition, MIM is easy to pronounce in all languages. I immediately adopted the idea.